We all have 24 hours in each day and we all have heard this saying. Let's face it, some of us have more on our plates than others. 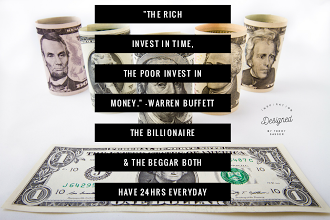 So it is really all about how we invest our time that can make a huge impact on our finances. Social Media is a huge drain for me if I allow it. I have used it mostly to connect with family and friends and many of us also use social media for our business marketing and research. I find that this something that I continue to tweak as I grow older and life changes. I have researched and read many books on how the wealthy population have used their time. Below you will find the top tips that I have heard and read from most of them consistently. 1- Knowledge - Invest in knowledge. Use some of your time to read a book, listen to audio, or any of the many ways you like to use to grow in the area of your knowledge bank. 2- Mentorship - We can excel our knowledge by our lifetime to infinity by having a mentor. This is the perfect way to save time and learn from others that have already been successful in the area you would like to grow. A mentor can be someone whom you know and admire or it can be someone that you follow online. We all need this in our lives. 3- GOALS & A Plan (MAP IT OUT) We all know about this but we are not consistent in doing it. Research and find the best way for you to set your goals and maps. I also have used dream boards. I have since changed to digital dream boards. This sets you up for success to have a purpose. 4- USE YOUR TALENTS - Your talents are something that is worth investing your time. They are a way to start your online business. You can use them in a way to help others as well as enjoy your passion in life. If you paint, you can offer your work to others all over the world online. If you like to share you can teach others. Many people are living the life of their dreams by using their talents. 5- OUTSOURCE- Think of the things that you have to do daily that you could outsource. You can invest your time where you can excel in both finances and in your happiness. Hire someone to clean, drop off your laundry, hire a sitter. Write down a list of things you don't enjoy and research ways to outsource those task. 6- NETWORK - there are many ways to network. Build a village and you will have a team in life that will help you when you need advice, want companionship, etc. You can build a network for business and your social life. You can start locally with your Church, meet-ups, groups, etc. with like interest. I would suggest that you have people from all walks of life in your network. Think of people whom you would like to have in your network and be sure to add at least one attorney, CPA, decorator, babysitter, teacher, physician, parents, mothers, entrepreneurs, etc. You can benefit from having people from all walks of like your network. 7- INCOME STREAMS - I have learned this the hard way. Never get comfortable in one thing. Have multiple streams of income. You have the choice of what they are. Do your research and decide what is most beneficial for you. 8- FAMILY & FAITH - These are not suggested in any order. I find that it is vital to put the important people in your life on this list. Without faith and family there is no hope. You may have people in your life that are not family by blood but feel like a family member. Be sure to keep them on your list as top priority as well as yourself. This list is a work in progress. Please feel free to add and share your list.